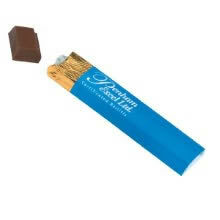 Corporate chocolate gifts could be the right promotional gift for your business? One of our insurance company clients regularly uses corporate chocolate gifts to promote and reinforce their life insurance product brand at events. These are small foil wrapped 25gm bars of milk or plain chocolate (however could be 50gm or 100gm or more depending on budget), with a paper sleeve that can be printed with a full colour design. These are very similar to the chocolate bars we are all familiar with, available from the local sweet shop or supermarket but when given out as corporate chocolate gifts, they take on a special meaning. It is also now possible to have your message directly printed onto the chocolate bars in edible inks. These are usually supplied in a clear lid cartons so that your client can immediately see your message, truly impressive. Individual - Small rectangular flat chocolates, foil flow wrapped or square and rectangular Neapolitan chocolates with a foil wrap and printed paper sleeve are perfect for giving out at conferences and exhibitions where people will often help themselves. These are usually available in a variety of flavours including milk, plain, mint or mint crisp and orange. Both these types of chocolate are also commonly used by hotels and restaurants to serve with coffee and tea after meals. Advent calendars- Advent calendars containing solid shaped chocolates are obviously a good item to use for promotions at Christmas time. The cardboard box sleeve can be printed in full colour and provides a large print area and advertising space. Many clients opt for the high quality handmade Belgium chocolates and truffles. These are commonly supplied for promotions as either 2, 4, 8 or 10 chocolates in a printed card gift box and often finished with a satin ribbon. These are ideal for use as table gifts at corporate events, parties and dinners. The drawback with using corporate chocolate gifts is that that once consumed and the packaging disposed of, they are no longer promoting the corporate message. There is a simple way to avoid this problem. Supply the chocolates or other confectionery in packaging that is reusable and useful to the recipient. What about using a metal tin or clear plastic box that can be personalised with a lid label? These are very attractive and are more likely to be kept by the recipient and reused, thereby continue to remind them of your brand and message with the added advantage of being an environmentally responsible option, as the packaging has been 'recycled'. small card pillow boxes, small deluxe cartons (usually made from one piece of card, often digitally printed with your artwork), deluxe cartons (tray with lid, often made from cardboard) either directly digitally or litho printed, or covered with a high quality paper and foil blocked in gold or silver. It is important to use good quality chocolate when giving a gift. 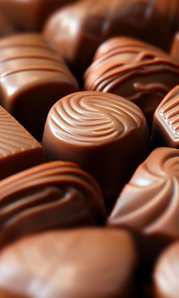 Everyone will have their preferred choice of chocolate whether it is milk, plain, flavoured, nutty, sweet or bitter. Remember, eating chocolate should be a pleasurable experience and evoke positive, happy emotions. Make sure you don't assault your client's palette with inferior, poor quality chocolate. As always, the best way to make sure is to try before you buy. You don't need to be a chocolate connoisseur to decide whether it is likely to appeal to the majority of your clients, just follow your taste buds. Corporate chocolate gifts are ideal for staff and client incentive and reward gifts, use as conference and company event gifts, product launches and other marketing campaigns. They are year round products, however can be particularly effective when combined with events such as Valentine’s Day, Christmas and Easter. Chocolates do not have to be used in isolation, they are excellent gift pack companions for Champagne, wine, Port, biscuits or even full food hamper packs.